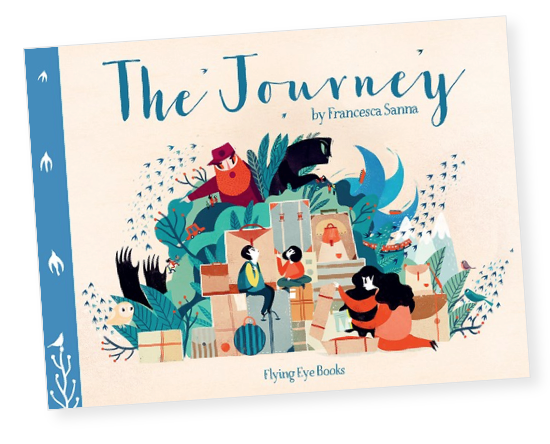 Sanna tells the story of a family who sneaks away in the middle of the night to seek asylum in a new country. They travel by car, on foot, over oceans, all to get to safety, and even as the book comes to a close they still haven't settled down. Their journey is so long that it transcends the boundaries of the book itself. The illustrations and text are timeless--they could refer to so many wars, past and present. It's heartbreaking and moving, and it hits very close to home given current affairs. The illustrations provide literal and metaphorical narratives, with giant black hands that reach out and take the life of their father and foreign forest animals see them off on their journey. Though the story is consistently told from one of the children's point of view--it's unclear which one--we get to see some of the scenes from multiple angles. The narrator tells us the mother is never scared, but as observers of this story we see more: on one spread, the mother is curled up with her children in the woods, a shining beacon of hope while they're awake but crying in the darkness when they're asleep. It shows her strength as a mother and a survivor so beautifully and so honestly. The Journey tells an all-too-common story in a powerful way, and it will stick with me for a long time to come.